When it comes to caring for your aquarium’s inhabitants, you need to carefully choose the right tropical fish food. Many first time fish owners are surprised by how many choices of food are available, but picking the right one usually comes down to the type of fish call your tank home. Here are some guidelines. For most freshwater tropical fish, you can simply use fish flakes. These are sold in small containers at any pet food store and even larger retail chains. The flakes contain the nutrients needed by the fish. You sprinkle them into the tank and you’re done. The mess is minimal, and the cost is quite low. Now if you also have fish that are bottom feeders, such as catfish, you are going to need some type of food that sinks down to them. Fish flakes float on the top and in the middle so they are not the best choice for other fish. Algae wafers and fish pellets are heavier and will sink down to where your bottom feeders can reach them. While flakes do a great job for most fish, you should consider adding something extra occasionally. For example, if you’ve invested all that money into saltwater aquarium supplies you should at least give the saltwater fish some krill to eat to brighten up their colors. You might also want to give blood worms or frozen fish food on occasion. These choices are not quite as mess-free and affordable but the fish love them. 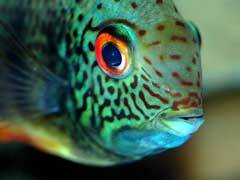 If you have any tropical fishes that are not strict herbivores, you may need to offer live food. Feeder goldfish are available at most pet stores and can be a good choice for carnivorous fish, such as the piranha. However, these feeder fish may carry diseases so you should consider quarantining them before serving them as lunch. The best tropical fish food for freshwater tropical fish you hope to breed is the brine shrimp. This type of food works to get the fish in the mood and are a great treat even for non-breeding fish. When it comes to choosing the perfect tropical fish food, you also need to consider the size of your aquarium tropical fish. Don’t give fish flakes alone to a huge Oscar, for example. He’s going to want something more substantial.